Cakes are definitive symbols of motherly care, but they can also evoke an old-fashioned notion of the housebound woman in a socially constrained role. “A Piece of the Pie Chart” by Annina Rüst (in the early 2000s part of the software art group LAN) is a technically sophisticated artwork that uses this symbolism against itself. 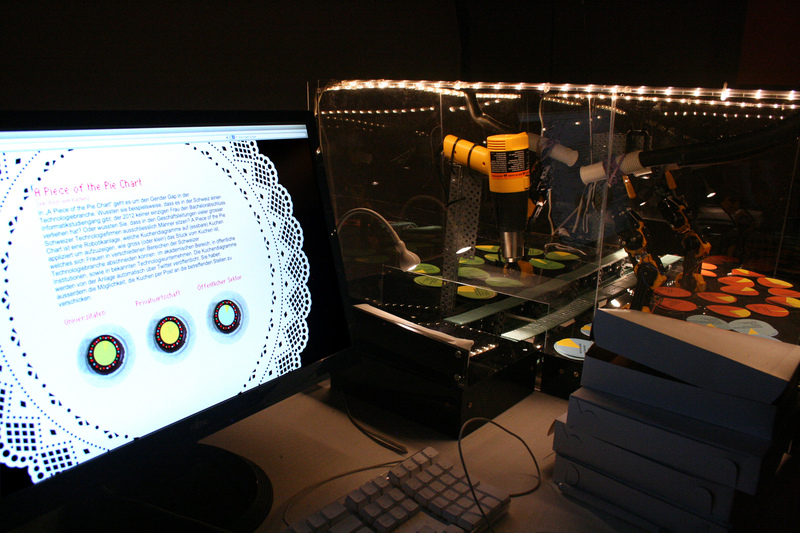 The robotic installation adorns real, edible pies, with pie charts describing the gender gap in technical environments like universities, companies, conferences, etc., and shares the generated pie charts via Twitter. Here, sophisticated technical apparatus is the automatic component in the creation of a feminist political gesture. But what the combination of technology and tradition does is to sketch a politically aware future in which gender questions can also be expressed by machines. The satire used by Rüst is direct and universal, and the outcome, with its specific interface for the user to control, is technically remarkable and radically conceived. A Piece of the Pie Chart, the feminist cherry on the cake.